Thank you so much for such an enriching experience over the weekend! 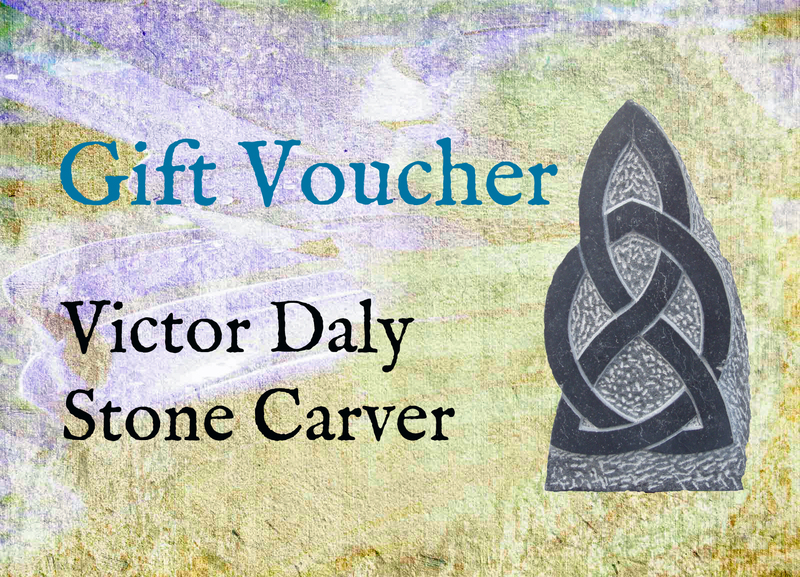 I highly recommend for anyone interested in stone carving to come on one of your courses. Or anyone wanting something completely different to anything they’ve done before. The setting is peaceful. The scenery is stunning. Being with you Victor in the studio was like reaching back into history. Your skill and knowledge is priceless. You have to experience it to believe it and I think everyone should try this. Stone lasts and we take for granted monuments and old buildings, I didn’t realise the human endeavour that has created all the marks and letters on buildings. I really urge anyone who has an interest if they see your website or the Sheep’s Head Way one then do a course with you. It’s too good to miss. It was only a weekend and yet I’ve now got something new that I will practise and use and I will be back. It’s very rare to meet someone who is a living example who has committed themselves to a path in life. But when you do it’s obvious that they are living their passion. To see Victor use the chisels, it looked like they were part of him. 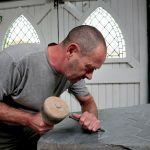 To join a course and find out about upcoming dates, see our stone-carving page or use our contact form to get in touch! Participants young and old worked with Kilkenny limestone and sandstone to create small sculptural pieces that they were able to take home with them at the end of the festival. Victor offers a range of courses from his own West Cork studio as well as working at events in Ireland and overseas. 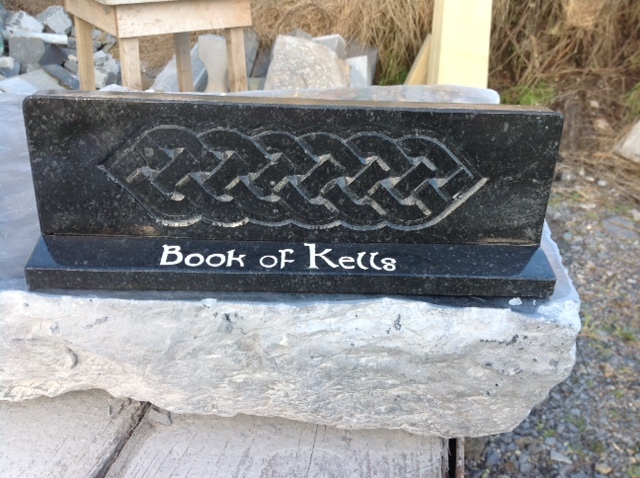 Last year Wilf Stock came to visit me on the Sheep’s Head peninsula for a weekend stone-carving course. Wilf took to stone-carving like a natural, and it was a pleasure to pass on to him some of the skills involved in carving letters in stone. After the course, 75-year-old Wilf bought himself some chisels, and since then he’s been working away on projects, and developing the skills of a letter cutter. Wilf returned to show me his work today (pictured below). I’m so impressed by what he’s achieved, all hand done by himself. Congratulations to him on his progress and the example he’s setting to anyone who would like to give this ancient art a try! Find out more about with Victor. You’ll find upcoming dates at http://livingthesheepsheadway.com/whats-on. Victor Daly has carved the Munster crest that takes pride of place on ‘The Gathering of Stones’ in the Lough Boora Discovery Park in Co. Offaly. The Gathering of Stones is a dry stone monument built by the people of Ireland for the people of Ireland across the world. All of the stone for this project, including Victor’s Munster crest, has been donated to the project, and the monument is being built entirely by volunteers. 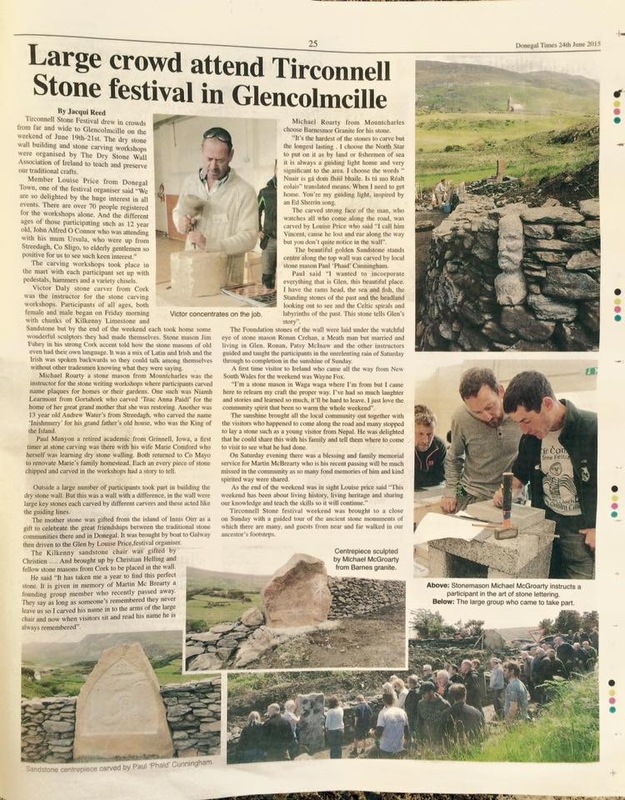 Find out more about the project from the Dry Stone Wall Association of Ireland website.